With both the Canadian and Finnish roster’s being announced today, it was a big day for several Flames Olympic hopefuls. Flames captain Jarome Iginla was a lock for the Canadian team, but Jay Bouwmeester appeared to be a "bubble" player and fellow defencemen Dion Phaneuf and Robyn Regher appeared to be longshots at best. On the Finnish side, big center Olli Jokinen and goalie Miikka Kiprusoff appeared shoe-ins, but with Kipper’s statement earlier this year about only going if he was named the starter, there was some doubt. Well, the Finn’s announced their team first and both Jokinen and Kiprusoff were on it. 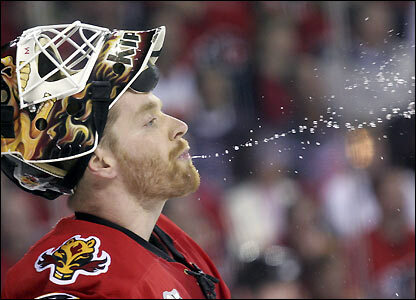 Kipper’s play this season left little doubt, as he’s been one of the top 5 goalies. For the rest of the Finnish roster click here. With the three defencemen all vying for what was considered to be 1-2 spots, someone was going to be left disappointed. We just didn’t know it would be all three. I had Bouwmeester on my roster, but Steve Yzerman and company went with Dan Boyle, Drew Doughty, Duncan Keith, Scott Niedermeyer "C", Chris Pronger "A", Brent Seabrook and Shea Weber, leaving Jay-Bo off the team. As expected, Jarome Iginla was named to the team. He was also named one of three alternate captains. With so many different "right" options at this point in time, it’s hard to question any of the remaining 12 forwards – Patrice Bergeron, Sidney Crosby "A", former Calgary Himen Ryan Getzlaf, Calgary native Dany Heatley, Patrick Marleau, Brendan Morrow, Rick Nash, Corey Perry, Mike Richards, Eric Staal, Joe Thornton and Jonathan Toews. The two surprises up front to me were the inclusion of Patrice Bergeron, who flew in under the radar having been the only player named that was not invited to Canada’s summer evaluation camp. Given recent projections from the likes of Bob McKenzie et al, his inclusion really shouldn’t be a surprise, I guess. Mike Richards was the other given his play in the second quarter of the season. However, he was virtually a lock prior to this season’s start, and Head Coach Mike Babcock is said to love the versatile center. He stood out as Canada’s best player in the summer evaluation, so again I really shouldn’t be that surprised. No surprises in goal, as Canada went with Martin Brodeur, Marc-Andre Fleury and Canucks captain *snicker* Roberto Luongo. So did the Canadian braintrust get it right? No matter what roster they picked, plenty of second guessing would commence. It’s hard to argue against this squad and only time will tell. Flame fan – Did they make a mistake in not including any of the Calgary defence? Should Bouwmeester have been there? Phaneuf? Regher? Drew Doughty is a hell of a player, but I would’ve taken Jay-Bo’s experience over him for these Olympics. Maybe that’s why I’m writing this and not announcing the team myself. If any good can come of this, hopefully it has lit a fire under the vaunted ‘D’. Then again, one would think a pretty big fire should’ve been lit all season considering the announcement planned for today. The LA Kings visit "The ‘Dome" tonight, as the Flames see if they can win two in a row and start a bit of a winning streak. A win tonight would set the table for a three game winning streak to round out the year as the Edmonton Oilers will visit on New Year’s Eve. Difficult to complain about a team as good as the one selected by Yzerman and the Canadian braintrust. I wouldn't change it but injuries most certainly will, you'd have to think Bouwmeester is the next guy if any of the current 7 D get hurt. That would be a fairly safe assumption IMO. Although Mike Green may slide in as well. I guess it would depend on who the injury goes to as for the type of defender they'd look to add. Injury WILL likely alter the roster somehow though. If Doughty is the 7th guy right now and therefore may not play a whole lot I'm wondering how much that factored into the decision? He's been very good this season but maybe the thought was that they'd rather have a 20 year old sitting than a vet like JBo. Team Canada's brass met until midnight Tuesday, and the most discussed topic was the seventh defenceman, according to TSN analyst Pierre McGuire. The two players they were talking about: Doughty and Bouwmeester. Good to see anything can happen as long as you creep as much as possible at Oilers Nation. Great effort out there Ross Creek. You are a real piece of talent. Honestly, I'm more shocked by Jokinen's being on the Finnish team than Bouwmeester being left off the Canadian. Say what you will about the strength of the Calgary defense on paper, and their ability to play the odd great game, but the defensive core hasn't lived up to expectations this season. J Bouw might have the experience (so does Reggie), but he's one of the big three that haven't been the stellar crew they were supposed to be – in either end of the rink. Maybe the lack of any Calgary D-men on the Olympic roster might clue them in on how far their play has slipped. Sure, Doughty's young, but the kid has chops. He's done a helluva lot for on the back end of an equally young team in L.A. to keep them where they are in the standings. Hey RossCreek, if you want to be a blogger than maybe you should use proper grammar is the title. You look like an incompetent dumbass when you spell Hopefuls as Hopeful's. Hopeful's would mean 'Hopeful Is' which makes no sense, or some sort of strange possessive format of a word that can't really show possession. I don't know, just a suggestion. A typo in an article's body is ok, but a major f*ck up in the title is just embarrassing.